The trick is to bring Houdini back. Show him to us. Let us hear him speak, watch him make his magic, feel his presence among us, let Houdini live again! Unidentified photographer, [Harry Houdini in a publicity photo for his silent film “The Grim Game”], 1919. Gelatin silver print, 20.3 x 25.4 cm. Or “activate the Houdini collection through performance.” Same thing, basically. The Harry Ransom Center is declaring October the month of Houdini, and the Center is marking the ninetieth anniversary of his death (October 31, 1926) with a display in his honor, a cooking class dedicated to some of his favorite Hungarian dishes, a screening of his film The Grim Game, and indeed a piece of theater illuminating at least one aspect of his fascinating life. 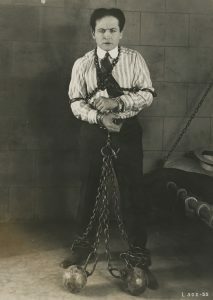 My task, as artistic director of The Hidden Room theater, was to dive into the treasure trove of the Ransom Center’s Harry Houdini collection, and see what secrets lay waiting to be told on stage. But how to turn Houdini’s papers into a picture of Houdini the man? In my many months of exploration of Harry’s life, (May I call him Harry now? Probably not. He wouldn’t have liked it.) I do feel like I’ve gotten to know him, and certainly I could argue that I know him as well as I can know anyone I’ve never met. But how well is that really? What do I really know? 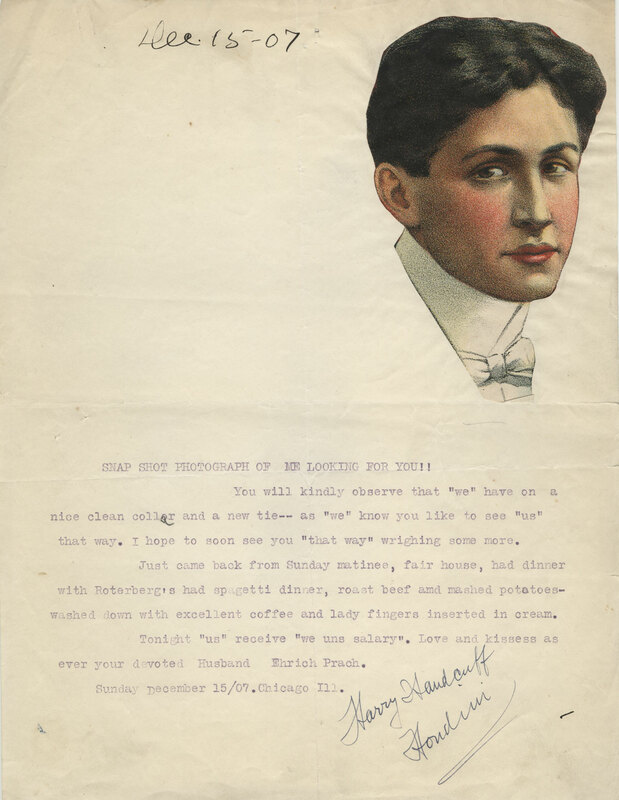 Letter from Harry Houdini to Bess Houdini, 15 December, 1907. Harry Houdini Collection. I know how strong he was physically—just trying to lift one of his ball and chain props was difficult. I know how hard he trained, both physically and mentally—he speaks of it often, and others often cite his almost super-human regimen. Friends said he could hold his breath underwater for ten minutes or more. I know how he loved to collect stories and artifacts from magicians and actors throughout history. I know that he greatly admired Abraham Lincoln, so much so that he named his trained eagle after our sixteenth President. I even have a hint of how he smelled, or at least how the safe where Bess kept his things smelled. It’s a nice, clean, woodsy smell—like Old Spice and shaving cream, with a note of coffee. But it wasn’t until I discovered that Houdini had a friend whose collection was also housed at the Ransom Center that I truly felt like a more complete picture of the man came into view. 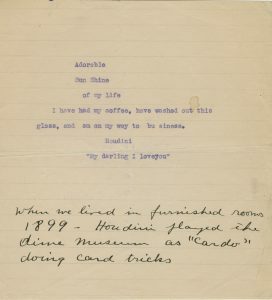 Just a few aisles away in the stacks live the papers of Sir Arthur Conan Doyle, where his back-and-forth debate with Houdini over Spiritualism (the scientific possibility of communication with the dead) feels as fresh and continual as though the two men never stopped arguing, even after death. On the trail of these miles of papers, a play began to take shape. 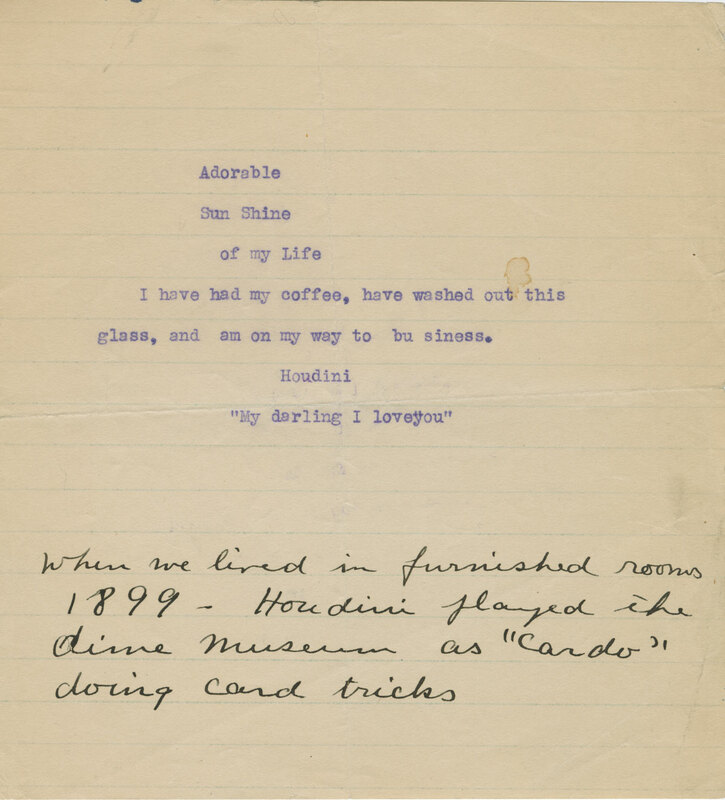 The Hidden Room’s Houdini Speaks to the Living is largely verbatim theater—about 75 percent of the text is quoted straight from the two men’s letters, essays, and books. 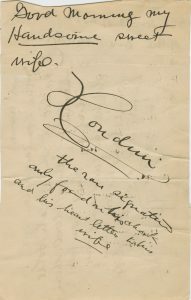 We were lucky that in addition to personal correspondence between the two, both Houdini and Doyle had competing lectures about Spiritualism—Houdini touring to educate the public against the dangers of fraud mediums tricking them out of their fortunes, and Doyle touring in hopes that this “great philosophy” would bring comfort to the many people who had lost loved ones in the wars. Further, both men dedicated full chapters of their books to debate with the other. 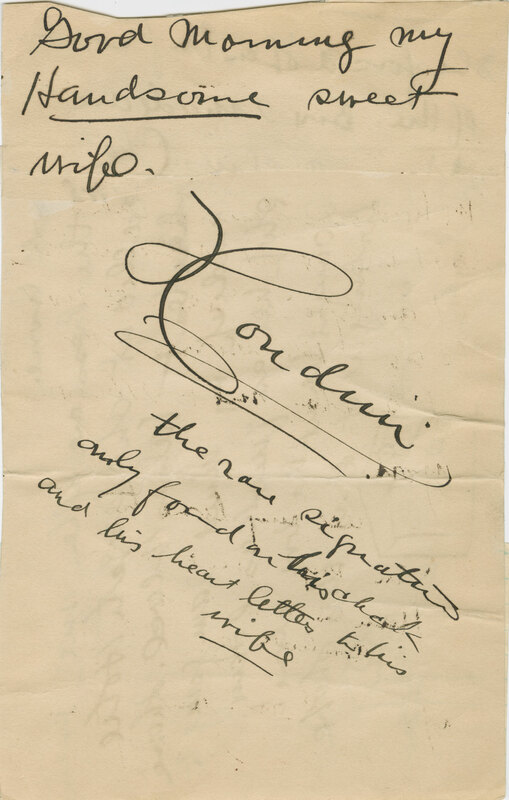 Houdini’s A Magician Among the Spirits carefully picks apart Doyle’s Spiritualism claims. 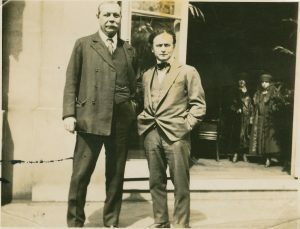 Doyle’s 1930 book The Edge of the Unknown, is filled with personal accounts of ghosts, séances, and spirit photography, and calls Houdini to task over his negative stance on Spiritualism, despite Harry’s inability to respond due to his death four years before. Putting these competing words together forms a lovely conversation, and constructs a portrait of these two luminaries, while reminding us that they were ultimately just people; one, a determined and hard-working Hungarian-born charmer with a love for his morning coffee, and an ever-ready poem cut from a book to paste onto one of his wife’s numerous love notes; the other a Scottish gentleman who never let a newspaper get a misstep by without a stern letter in return, and who wore an unremarkable sock with a hole in the toe the day he died. On October 21 through 30 at the York Rite Masonic Hall, and October 31 in a special free presentation at the Ransom Center, acclaimed New York magician Patrick Terry will conjure Houdini, and multi-award winning actor Robert Matney will channel Sir Arthur Conan Doyle. 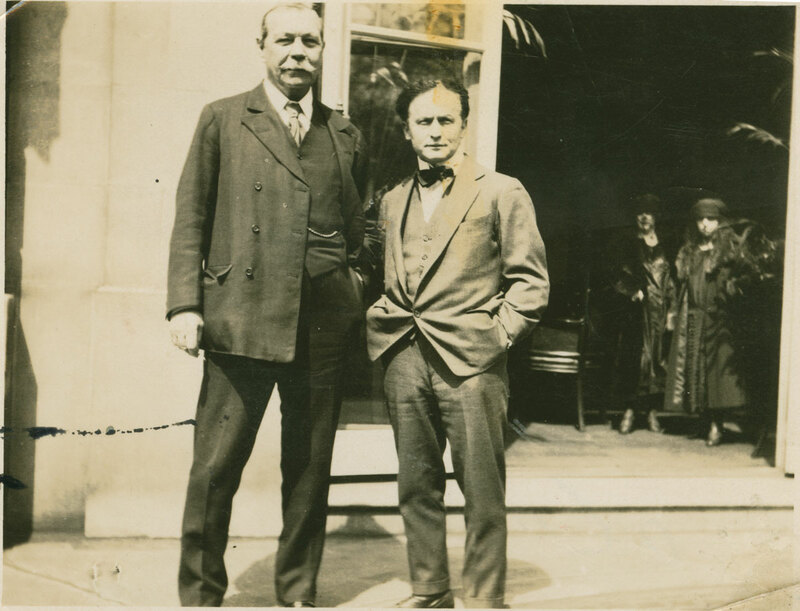 Their debate will rage on through magic, ghost tales, and the words of these two friends as pulled from the Ransom Center’s incredible collections—thereby performing the one trick that the Spiritualists could never achieve, bringing Houdini back to us. Beth Burns is Artistic Director of The Hidden Room. View information on their performance of Houdini Speaks to the Living at www.hiddenroomtheater.com. As Artistic Director Burns announces above and as I witnessed on the 90th anniversary of Houdini’s death in the Prothro theater, Patrick Terry “conjured” Houdini, as Robert Matney did for Sir Arthur Conan Doyle. But I want to go further and assert this: It became apparent that Terry and Matney are gifted mediums whose sensitivity to the spirit world allows them to lend embodiment — for all too brief a time — to these two personages who left this plane so long ago. Of course, they will deny this and claim, like Houdini himself, that their “show” was founded on mere acting skill and material methods. I was there! I know otherwise!